Scott and Dana Jurak have been coming to Provo since 2002 and they have lived here for almost the entire time. 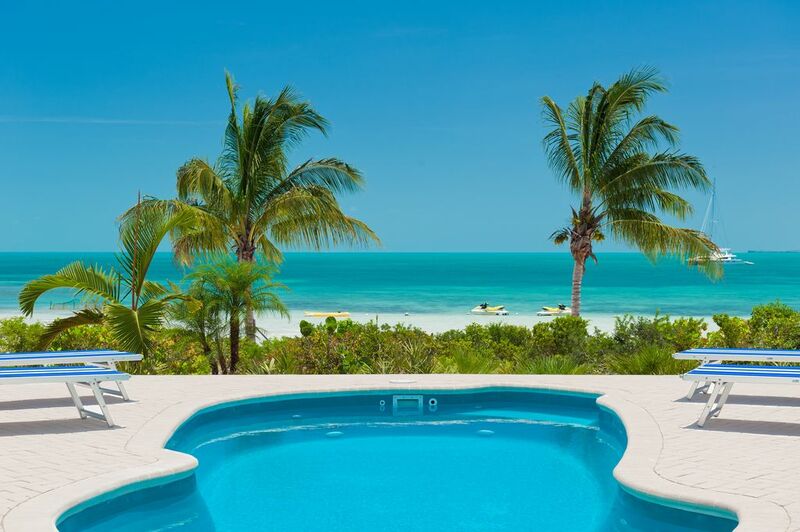 They own and operate Crystal Sands Villa, Coconut Beach Villa and Grace Bay Townhomes. Both feel that they have never had a better job experience! Sapodilla Bay Beach has been named by Fodor's as one of the best beaches on the island. We agree. We think it is the best! It is a private residential community, yet is it just six to ten miles from all the commercial activities of the condo/hotel zone! Baths one and three are completely private to the bedroom. Baths two and four are connected to the second and fourth master bedrooms and they have doors to the hall, which could be used by the guests who sleep in the dens. The most spectacular beach on the island! Sapodilla Bay Beach! (2) Unlimited local calls. Long distance calls require a credit card. Optional AC is available for those who would like to use it. Cost charged to the traveler is based on metered usage. (2) There are two washing machines at Coconut Beach Villa, one in each suite. (2) There are two dryers in Coconut Beach Villa, one in each suite. (2) A very quiet dishwasher! (2) Our icemakers have filtered water. (2) There are two kitchens at Coconut Beach Villa. They each have stainless steel appliances and glorious granite counter tops! Outside dining tables can seat 12 as well. Our swimming pool is private. If two separate parties rent our suites, then it is shared between the two parties. Coconut Beach Villa is located on the most spectacular beach on the island, Sapodilla Bay Beach. Optional air conditioning is available at additional cost which is based on metered usage. Our swimming pool is private. Two full Kitchens: Stainless steel appliances. Glorious granite counter tops!. A very quiet dishwasher!. We offer unlimited local calls. Long distance calls require a credit card. Other Amenities: Pack and Play with linens, Security System, Lounge chairs and Beach Chairs, Private boardwalk to the beach with foot shower, Prolific tropical landscaping. We, two generations, celebrating an eighty fifth birthday, rented both sides of the villa. With two couples and two singles , it was wonderful to have the 4 king bedrooms so that nobody felt slighted. We had a lot of space and loved the luxury of it all. Coconut Beach Villa was the perfect vacation for our family. The peace and quiet of Sapodilla beach is hard to beat. The water is always calm even on the windiest days. The shallow water is also perfect for young kids. There are plenty of beach toys available for use as well. The villa itself is in excellent condition, well appointed and very clean. Honestly there was nothing we looked for and couldn't find. The rooms have plenty of space and the trundle day bed was great for the kids. We prepared most meals in house but there is a great restaurant (Las Brisas) a couple minutes away. The grounds are well maintained and tended to regularly. The pool was cleaned twice during our stay. The pool to beach distance can't be beat with kids running back and forth and even when at the pool the view of Sapodilla bay is unobstructed. The patio are includes a hammock which was a popular spot. The owners take great pride in the property and went above and beyond to ensure our stay was everything we had envisioned. From the first inquiry, through the booking process and any pre trip questions we had their responses were very quick and helpful. Without any hesitation, we would be thrilled to have an opportunity to vacation at Coconut Beach Villa again! We traveled with 2 families with young children and this property was even better than the pictures. The beachfront is wide and quiet on a beautiful beach. The hammocks on the patio were perfect for relaxing in the shade. We are already considering when we can make a return trip! We used the kitchen and the grill to prepare most breakfast and lunches during our stay and went to restaurants most evenings. The sunset over the water is an amazing view each evening. We travelled with 5 young kids in our group and the pool was a hit with them, as well as all the sand and beach toys at the property. The view was fantastic. The kitchen was fully equipped and the unit meet all expectations. It was very clean and the owners responded to our propane needs very quickly. Would highly recommend this villa to anybody. The property is beautiful. Updated and clean. The property is really nice! It is updated, attractive, clean and spacious! The landscaping and boardwalk to the beach is very nice, leading to a roped off private area at the beach. The water there is absolutely beautiful! Beautiful beach lounges and chairs at the pool. Very good quality! A large Weber Genesis grill to cook on. Everything about the property was perfect for us. Owners Dana and Scott were very friendly and very nice to work with. We booked their place again before we left! We highly recommend! There were 10 family members in our group ranging from 3 years old to 65 years old and Coconut Beach Villa was the perfect location. The youngsters had a great time alternating between the beautiful bay and the pool with a nice outdoor shower in between. Very easy to keep an eye on them no matter where they roamed but they never wanted to go too far. This beach is just a few steps away from the villa and the bay is very protected from the wind allowing for swimming anytime. Towels and beach toys are in abundance so we could travel lightly. The villa has everything needed to stay right in and cook if that is your choice. Dana and Scott are wonderful hosts. They made sure everything was ready, gave us an orientation and then were just a phone call away. We had a very minor electrical repair (a fan switch) that was addressed in less than an hour. It is obvious they are very proud of this villa and it shows. There are water sports equipment(kayaks, paddleboards and jet skis) available from many vendors on the island, some right down the beach. With that said, it is very quiet and peaceful down at the end of the beach where Coconut Beach Villa is located. When we planned this vacation it was going to be a once in a lifetime getaway for my family. Now it is just a question of when we will return. I am sure it will be sooner rather than later. Sapodilla Bay Beach is idyllic! The reviews continually highlight the calm, tranquil sea and the pure white sand. Whereas it is fun to explore and visit every beach, our guests come back again and again to Sapodilla Bay Beach. It is the kind of place where memories are made and they can be recaptured easily. Children of all ages are drawn to the serenity and visual impact of this beach. Sunsets are so glorious that one simply has to experience them. Imagine yourself relaxing with a cool drink in your hand, whiling away the hours, sunning, sleeping, reading....letting the stresses of everyday life pass you by! There is no better place than this wonderful piece of Heaven that we have been granted. Just six miles from the airport in an exclusive area! CONFIRMATION: A reservation is confirmed upon receipt of deposit and completed reservation agreement. We can manage your visit effectively when we have the information to do so. OWNER’S CANCELLATION POLICY: 20% cancellation fee if a reservation is cancelled prior to 90 days before arrival. We offer no refunds within 90 days of arrival unless the villa can be rebooked. We STRONGLY recommend “Cancel for Any Reason” insurance available from reputable insurance companies for anyone who has any reason to believe he may cancel at any time. Travelers can obtain such insurance; Owners cannot. In most cases, you MUST have your own insurance to receive a refund. We do make efforts to rebook, but we cannot guarantee success in these efforts. RATE CHANGE: Rates are subject to change without notice. SATURDAY CHANGEOVER: Our villa typically rents for seven night periods, although we are flexible with last minute availability. We will accept a five night reservation if it falls within our Saturday-Saturday week. SELF-CATERING VILLA: Our villa is self-catering. Please leave it as you have found it. We can continue to offer a great value as long as we have the wonderful, respectful guests that we have had in the past!